Custom post types lets you create your own custom content like posts and pages. This functionality makes WordPress a powerful content management system. Even though most code monkey’s can easily figure out how to use custom post types, WordPress doesn’t have an easy way for an everyday user to make use of this powerful functionality. Folks at Themergency.com has created a wizard driven code generator for WordPress custom post types. You just fill in all the details about your custom post type and it gives you the code you need to plug into your functions.php file in your theme folder. 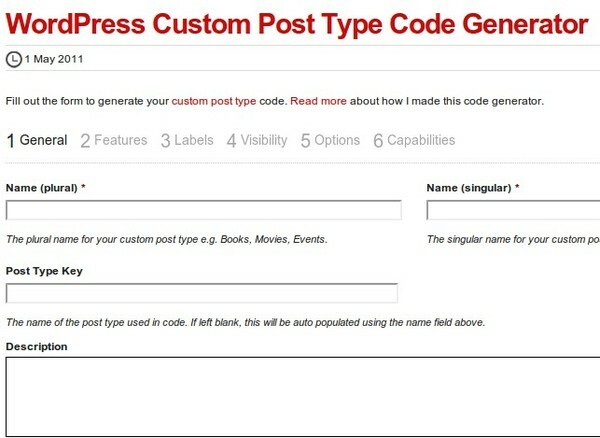 Check out WordPress Custom Post Type generator. Also, WordPress 3.1.3 and WordPress 3.2 beta 2 are out.